To get in touch please share your details with us. All Categories of Investors can apply in Secured NCDs across all Series of different tenors in 400 days, 3 years, and 5 years. Minimum application size is ₹10,000 (10 NCDs) across all series collectively. Monthly, Annual and Cumulative interest payment options available. The Issue is rated 'BWR AA+ (BWR Double A plus) (Outlook: Stable)’ by BRICKWORK. The Secured NCDs are proposed to be listed on the BSE to provide liquidity. Application in demat mode through ASBA only. There is no tax deduction at source (TDS) on interest income for NCDs in demat form. ^Additional incentive of 0.25% p.a. for all category of investors who are existing holder of NCD(s)/Bond(s) previously issued by our Company and/or Srei Equipment Finance Limited (“SEFL”), in the past NCD issues and/or are equity shareholder(s) of our Company and/or are Senior Citizens and/or are Employees of Srei Group, on Deemed Date of Allotment. Additional incentive will not be applicable for any Category of Investors subscribing to series of 400 days. Allotment of NCDs will be on first-come-first-serve basis#. Institutional, Non-Institutional Category Investor(s), Individual Category Investor(s) and Trusts & Society Category of Investors can subscribe to all Series of NCDs. *** Our Company shall allocate and allot Series IV NCDs wherein the Applicants have not indicated their choice of the relevant NCD Series. For all category of Investors in the proposed Issue and who are holders of NCD(s)/Bond(s) previously issued by our Company and/ or Srei Equipment Finance Limited (“SEFL”) and/or are equity shareholder(s) of SIFL and/or Senior Citizens and/or are existing employees of Srei Group on the Deemed Date of Allotment and who have subscribed for Series III, Series IV, Series VI and/or Series VII NCDs shall be eligible for additional incentive of 0.25 % p.a. 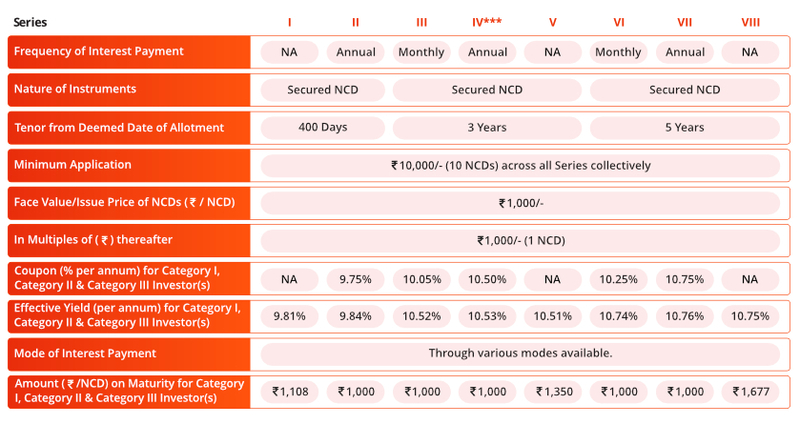 provided the proposed NCDs are held by the investors on the relevant Record Date applicable for payment of respective coupons in respect Series III, Series IV, Series VI and/or Series VII and are NCD Holders on the Record Date for redemption of NCD in case of Series III, Series IV, Series VI and/or Series VII NCDs. For all category of Investors in the proposed Issue and who are holders of NCD(s)/Bond(s) previously issued by our Company and/ or SIFL and/or are equity shareholder(s) of SIFL and/or Senior Citizens and/or exiting employees of Srei Group on the Deemed Date of Allotment applying in Series V and/or Series VIII NCDs, the maturity amount at redemption along with the additional yield would be ₹1,359/- per NCD, and ₹1686/- per NCD respectively. Any category of Investors subscribing to Series I NCDs and Series II NCDs shall not be eligible for any additional incentive, regardless of their qualifications as mentioned herein above. On any relevant Record Date, the Registrar and/or our Company shall determine the list of the Primary holder(s) of this Issue and identify such Investor/ NCD Holders, (based on their DP identification and /or PAN and/or entries in the Register of NCD Holders) and make the requisite payment of additional incentive. The additional incentive will be given only on the NCDs allotted in this Issue i.e. to the Primary holder(s). In case if any NCD is bought/acquired from secondary market or from open market, additional incentive will not be paid on such bought/acquired NCD. In case the Primary holder(s) sells/gifts/transfer any NCDs allotted in this public issue, additional incentive will not be paid on such sold/gifted/transferred NCD except in case where NCDs are transferred to the Joint holder/Nominee in case of death of the primary holder. Senior Citizen(s) have to provide self -attested copy of PAN card as additional KYC document for the eligibility of additional incentive of 0.25% per annum. In case of non-receipt of copy of PAN along with application form while applying for the NCDs of the proposed Issue, the additional incentive of 0.25% p.a. will not be applicable. Employees have to provide a copy of employee ID card or written certificate from human resource department of Issuer along with the application form to avail additional coupon of 0.25% p.a. Srei Infra has been one of India's largest holistic infrastructure institution, with over 25 years of history in the infrastructure sector. Srei Infra manages an Asset Under Management of ₹470,503 million, a Net Worth of ₹51,234 million and Profit After Tax of ₹3,845 million as on March 31, 2018 on a consolidated basis. SIFL's equity shares are presently listed on the NSE and the BSE. Srei Infra is classified as “Infrastructure Finance Company Status (IFC)” by the Reserve Bank of India (RBI) within the overall classification of Non-Banking Finance Company. The business model of our Company encompasses providing financial products and services for our customers engaged in infrastructure development and construction, with particular focus on energy, road, railways, telecom, port, water and sanitation, oil and gas, special economic zone, urban public transport and logistics sectors in India with a medium to long term perspective. *For terms and conditions please refer to the Tranche 1 Prospectus read along with Shelf Prospectus both dated March 29, 2019 filed with ROC, BSE and SEBI. @ The Tranche 1 Issue shall remain open for subscription on Working Days from 10 A.M. to 5 P.M. (Indian Standard Time) during the period indicated above, except that the Tranche 1 Issue may close on such earlier date or extended date as may be decided by the Board/ Committee of Directors, as the case maybe, subject to necessary approvals. In the event of an early closure or extension of the Tranche 1 Issue, our Company shall ensure that notice of the same is provided to the prospective investors through advertisements in a leading national daily newspaper with wide circulation on or before such earlier date of Tranche 1 Issue Closure or initial date of Tranche 1 Issue closure, as the case may be. On the Tranche 1 Issue Closing Date, the Application Forms will be accepted only between 10 a.m. and 3 p.m. (Indian Standard Time) and uploaded until 5 p.m. or such extended time as may be permitted by the Stock Exchanges. #Allotment in the public issue of debt securities should be made on the basis of date of upload of each application into the electronic book of the stock exchange. However, on the date of oversubscription, the allotment should be made to the applicants on proportionate basis. The following is a summary of the terms of the NCDs issued vide the Tranche 1 Prospectus dated March 29, 2018 filed with the Registrar of Companies, Kolkata, West Bengal (ROC). Kolkata, West Bengal (ROC). Disclaimer Clause of BSE:: It is to be distinctly understood that the permission given by BSE Limited should not in any way be deemed or construed that the Prospectus has been cleared or approved by BSE Limited nor does it certify the correctness or completeness of any of the contents of the Prospectus. The investors are advised to refer to the Prospectus for the full text of the Disclaimer clause of BSE Limited. Disclaimer Clause of BSE Electronic Platform: It is to be distinctly understood that the permission given by the BSE to use their network and software of the Online system should not in any way be deemed or construed as compliance with various statutory requirement approved by the Exchange; nor does it any manner warrant, certify or endorse the correctness or completeness of any of the compliance with the statutory and other requirements; nor does it take any responsibility for the financial or other soundness of this Company, its promoters, its management or any scheme or project of this Company. Disclaimer Clause of SEBI: It is to be distinctly understood that submission of the Offer Document to the Securities and Exchange Board of India (SEBI) should not in any way be deemed or construed that the same has been cleared or approved by SEBI. SEBI does not take the responsibility either for the _nancial soundness of any scheme or the project for which the Issue is proposed to be made or for the correctness of the statements made or opinions expressed in the Offer Document. The investors are advised to refer to the Offer Document for the full text of the “Disclaimer Clause of SEBI”. Disclaimer Clause of Issuer: Srei Infrastructure Finance Limited is, subject to market conditions and other considerations, proposing a public issue of secured redeemable non-convertible debentures (“Secured NCDs") of face value 1,000 each amounting to 1000 million(“Base Issue Size”) with an option to retain oversubscription upto another 4000 million, totalling upto 5000 million (“Tranche 1 Issue Size”), with in the Shelf Limit of 15,000 million and is being offered by Tranche 1 Prospectus dated March 29, 2019 containing terms and conditions which should be read along with the Shelf Prospectus dated March 29, 2019 both filed with ROC, Kolkata, BSE and SEBI. The investors are advised to take decision to invest in the NCDs pursuant to their examination of the Issuer and on the basis of the disclosures made in Tranche 1 Prospectus read along with Shelf Prospectus and “Risk Factors” beginning on page no. 17 of the Shelf Prospectus dated March 29, 2019 in this regards.